Spring is springing across the US, and it's time to get back out into the garden. 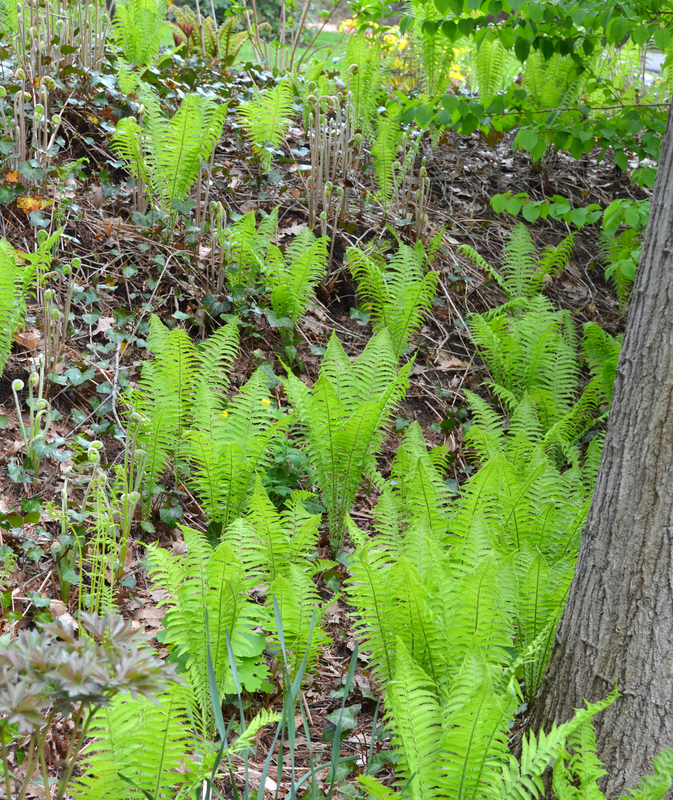 If you're wondering what to tackle first, I'll share the gardening tasks I completed recently in my zone 6a shade garden, starting with the most important thing I do first every spring. Hint: the secret is in the sauce! Gardeners everywhere are bearing big grins this time of year, exuberant in getting back outside to get their "spring manicure." A little dirt under the fingernails never hurt anyone, right? Since the weather has been so mild as of late, I finished my spring cleanup early. Since I do a thorough cleanup every fall, there isn't much left to cut back in spring save for a few perennials I leave standing for winter interest. 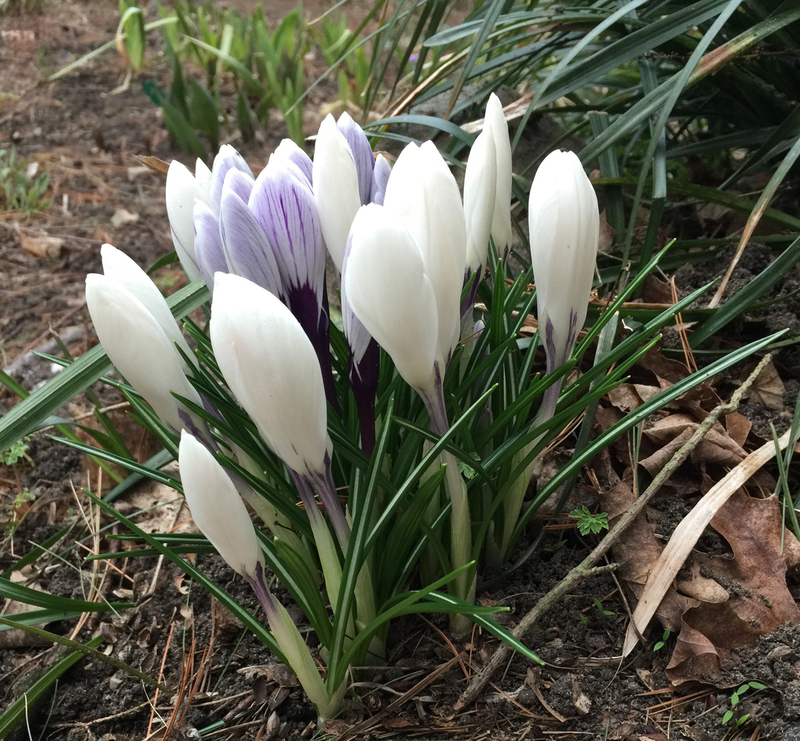 Crocuses embody the spirit of springtime. Every year at this time, as my bulbs and perennials are just barely starting to peek through the soil, I complete one of the most important tasks of the year. Since I garden on what is essentially a forested sand dune, my native soil is very poor and requires enrichment to grow beautiful flowers. Each spring, I scatter a mix of compost and manure on top of all my garden beds. For the first time this year, I added mushroom compost too. These nutrients supplement the shredded leaves I spread on my garden beds each fall, which add organic matter and texture to the soil. Soil amendments and plant food are scattered across garden beds each spring. Unfortunately, rabbits found these tulips before the Plantskydd was spread. On top of the soil amendments, I scatter a handful of organic plant food that is specially formulated for acid-loving plants around all my Hydrangeas, Hollies, Rhododendrons, Azaleas and other evergreens. I do this just before we are due to have a good rain, which will help to work the nutrients down into the soil. The earthworms, which are abundant in my garden, do their part to enrich my soil too. Without good soil, even the best plants will struggle. Enriching your soil is one of the wisest investments you will ever make in your garden. As I was scattering my soil amendments in my garden beds, I happened across a fresh, deep hoof print that could only belong to the neighborhood deer that comes along now and then. Some years, he is a no-show. This year, he came early. Like a hound with its nose to the ground, I tracked his prints right through the middle of one of my favorite garden beds and then along the front border which is lined with blooming crocuses. 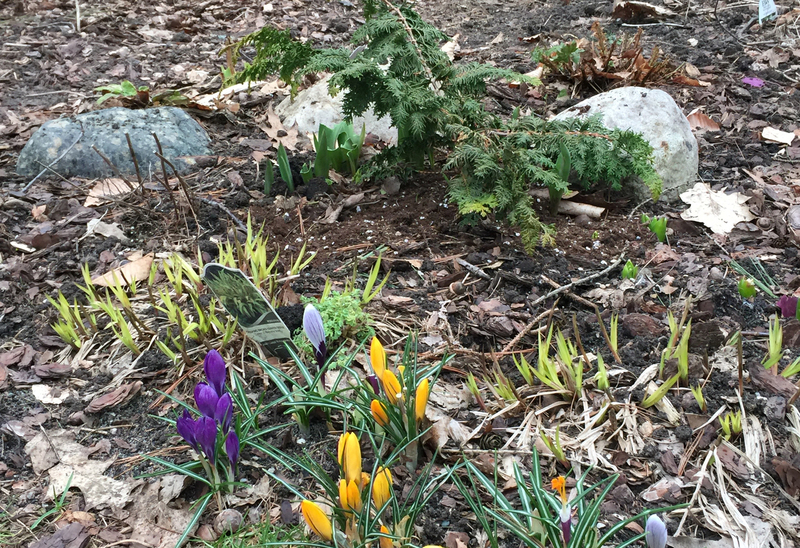 Only then did I realize that some crocus flowers were conspicuously missing, including the yellow ones. Apparently, he didn't get the message from the rabbits that those aren't as tasty. At the first sight of deer damage, I hauled out my bag of granular Plantskydd animal repellent and scattered it thoroughly around all of my crocuses and throughout my perennial beds. Next time Mr. Deer visits, he will think twice before sampling my flowers. I have to laugh when my neighbors see me spreading Plantskydd, because they then immediately follow suit and start spreading it too. They know that if the deer and rabbits aren't eating in my garden, they will be eating in theirs instead. 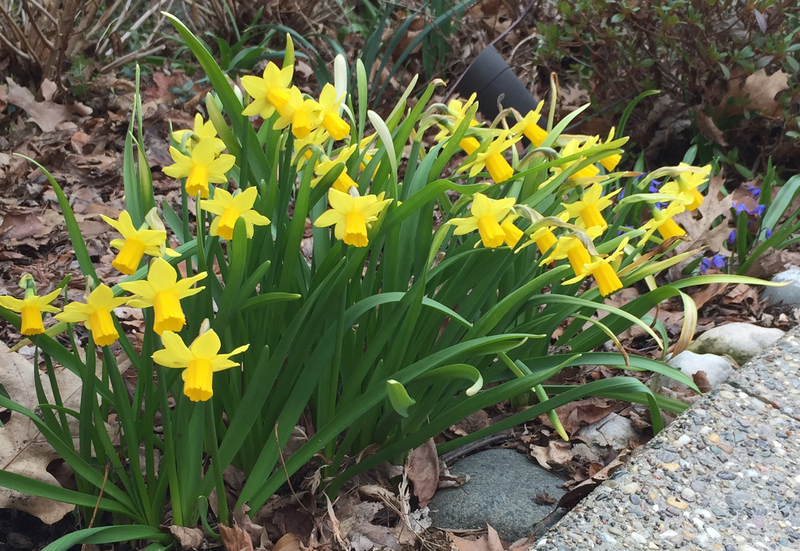 Daffodils are easy to grow and rarely bothered by pests. On a mild 55-degree afternoon, I felt the itch to start digging, so I planted my first new perennials of the season—Lenten roses (Helleborus). These cool weather loving plants grow most actively in the colder spring and fall months, so it's a good idea to get them in the ground early so they can set their roots before summer's heat sets in. An added bonus: deer and rabbit won't touch them. I'll wait a few more weeks for the soil to warm up before I plant any more perennials. I did move a few small evergreen shrubs, since they too grow most actively in spring. I (literally) dreamed of a fun new idea for my ferny hillside, where I envisioned bright blue forget-me-nots (Myosotis) popping up in spring while the ferns still lie dormant. A meager underplanting of ivy exists in this bed, but since I was planting seeds, the ivy's roots weren't a problem. I expect them to sprout and bloom before the ferns are fully emerged each spring, and then be covered by the time they go summer dormant. If I'm lucky, they'll reseed where they are happy. Forget-me-not seeds were recently planted between the ferns on this hillside for spring color. Next year, they will sprout and bloom before the ferns fully emerge. This is also an ideal time to reseed the lawn or fill in patches that didn't make it through the winter. I patched a strip of grass in a west-facing, yet shady, location by roughing up the bare soil with a neat new hand blade I'm trying out and scattering a shade grass seed mix. I'm hoping the spring rains and cool temperatures will encourage it to sprout slow and thick. I've started the annual lineup of potted plants along my driveway already. There are only four pots so far--two pots of tulips, which I overwintered in my unheated garage, one newly potted up and still-dormant hydrangea, and a new evergreen Thujopsis shrub which has to wait to be planted until more things come up in the garden so I can find a good spot to tuck it in. More pots will surely be added to the lineup as spring progresses. On a good year, I get everything planted by late July, but then the fall planting lineup begins. The driveway just seems so bare without plants on it. I can't believe it, because this NEVER happens, but I think I am actually caught up in the garden. Dare I say it? I'm sure I will think of something I missed. Every day is a new adventure in my garden.